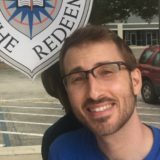 Tim Smith has been the Director of Student Ministry at Church of the Redeemer Anglican since January, 1st 2018. He has a long history in student ministry, both participating in it as a student and working in it occupationally. Having already been actively involved in a volunteer capacity, Tim began working as a Youth Pastor in 2010. Since then, he has had the opportunity to serve with multiple churches, implementing various models of student ministry in our diocese, working with middle school and high school students. Tim grew up in the Tampa Bay area where his love of youth ministry began. Starting in middle school, he began attending multiple youth groups and joining mission trips, camps, and conferences. Tim moved to Tallahassee where he earned a Bachelor’s degree from Florida State University in Philosophy, and through distance learning, a two year certification in “Spiritual Formation and Congregational Development” from the Ambrose Institute at Nashotah House Theological Seminary. Tim met the love of his life, Ana, in middle school, started dating her in high school, and married her early in college (December 2006). They have participated and served in student ministry together since high school and were actively involved as student leaders in InterVarsity Tallahassee. They are excitedly expecting their first child this December. Tim can be reached at journeyman171@gmail.com and (904)601-6776.